The Santiago collection radiates truly easy, comfort and luxury all at once. This washed and rough-dried linen shows the nicest and most identifiable side of linen: the characteristic linen wrinkle. 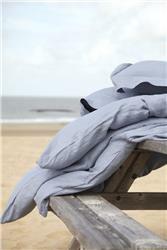 NEW 2013 - the Vence collection is now incorporated into the Santiago collection as a pre-washed and rough dried 100% Belgian Linen fabric. Please note the Plum color is no longer in production. Select Bedding Size Twin (D)- 64"x86" euro - 25"x25" Full/Queen (D) - 86"x90" King (D) - 104" x 90" Twin (T) - 71"x118" full/queen (T)- 95"x118" King (T) - 106"x126" twin (B) - 39"x76"x13" full (B)- 55"x76"x13" queen (B) - 60"x80"x13" king (B) - 78"x80"x13" california king - 72"x84"x13" standard (PC) - 21"x31" King (PC) - 21"x40" Standard (SH) - 20"x30" King (SH) - 21"x37" King D 106" x 90" queen D 88"x90" standard PC 21" x 33" super euro 25" x 39"
The duvets have a hidden button closure.